Social media is taking over our lives. This is not up for debate. The new movie Sorry To Bother You is based in the 70s, but many of the same social themes are still quite relevant today: Race relations, corporate greed, classism, making changes to not scare white people at your lucrative job, the plight of working class citizens and more. Shocker? Nope. 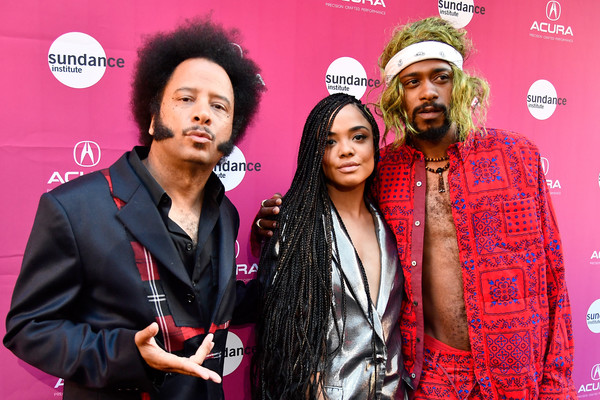 Inspired by his time as a telemarketer, writer/director Boots Riley (Pictured at left, above) created a film filled with comical satire about a guy named Cassius Green (played by Lakeith Stanfield) who nabs a job at a telemarketing company in Oakland. He got the job to impress his girlfriend Detroit (played by Tessa Thompson) and to pay back his Uncle Sergio (played by Terry Crews). Stars Tessa Thompson and Lakeith Stanfield sat down to chop it up with TheYBF.com to share what they want people to take away from the film. "My hope is that people come to the story with an open mind and are able to receive and retain whatever they feel personally," Lakeith told YBF correspondent Unique Chapman . "I can say what I took from Cassius, just reinstating the idea to remain steadfast and tenacious in your pursuit of not only higher and better things for yourself, but also a sense of self and identity in the world. And just be willing to fail so you can grow. So I hope people can see the parallels between those things." "In terms of dehumanization, social media is incredible for being able to disseminate information and create community, but I think we also get into a space where we're bombarded with images and we feel disconnected from the fact that they are happening in actual in this click bait culture," Tessa explained to TheYBF.com. "I think if you show people images enough, human beings become comfortable with things after a while and we adapt," Lakeith shared. "We've always had to adapt but now there's less censorship." He continued, "But, the internet is also a place where you can be insensitive and that's OK because you're removed from the experience. So you can say and feel and do things that you wouldn't do in real life. So in a sense, it feels like people are becoming less sensitive but I don't think that's the case. People are more sensitive, but now we just have these avenues that we can explore and safely not have to come into contact with these things. So, I say spend less time on the internet everyday and get back on the ground." Lakeith is dropping some truth serum on the masses. Do you agree with his point? Are people more sensitive now? Or, does it seem like they are since we now have different platforms to express our sensitivity? Sorry To Bother You will be in select theaters July 6th and everywhere else on July 13th. PREVIOUS: C-Murder's Lawyer Files To Get Homicide Conviction Overturned After SECOND Key Witness Recants Testimony!